A Number-Free Environment : Boulder Problem Grading - Salt Pump Climbing Co.
At Salt Pump, we are deeply invested in the climber’s experience. Whether you are a first time climber or a grizzled veteran of the vertical, we want your experience at Salt pump to be exceptional. We do not want grades to get in the way of this experience. Normally after a new ‘set’ goes up at Salt Pump, there are no grades on any climbs in that set for at least a week. We’ve observed that during this period climbers are more likely to try routes that may be above the numerical difficulty that they are usually comfortable climbing. We’ve also noticed climbers walking away from a route or problem after a quick glance at the proposed grade without trying or even looking at the holds and the proposed movement. We call this the ‘subversive’ influence of grades. So, in our constant effort to enhance the Salt Pump experience, we want to experiment going numbers-free in the bouldering area. Don’t worry, we are not erasing grades from Salt Pump! Instead they will be written on the backside of the route placard. However, by design, the grade will not be the first thing you see. We hope this experiment will result in, first and foremost, encouraging you to get on whatever inspires you and learn new movement as you try hard. Grading has always been a subjective process and always relative to the climbing location. The difficulties in a granite slab climbing area are very different than those of a steep sandstone crag, thus the grading should be relative. The key is that each locale keeps their grades relative to and consistent with the ratings of each of the other climbs. This locale specific nature of ratings holds true for climbing gyms. 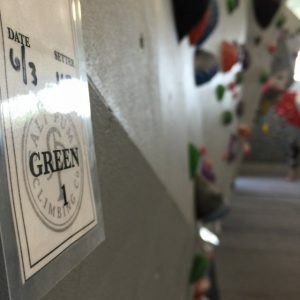 If you normally climb at a gym in Boulder or Los Angeles, you may find that a V4 in a gym in Chicago, Portland or Philadelphia will be easier or harder, as the case may be. This is because humans apply a subjective set of guidelines derived from local experience and, as we know, humans are all different. Most gyms have ‘local’ climbing areas, and the grades are often relative to those areas. Some gyms ‘soften’ their grades to make their members feel better about their climbing. At Salt Pump, we simply want our grades to be consistent and our climbers to have fun in the process of discovering the movement. The aim of Salt Pump setting is to create the majority of our routes and problems to be accessible for a climber of the ‘average’ height and reach of our members. The “subversive” influence of grading on a climber’s experience is usually less of an issue in roped climbing, because there are so many moves that the impact on grading caused by any differences in height or reach are diluted by the amount of moves and holds. For example, within the 30’ to 60’ length of a particular roped climb at Salt Pump, there will be moves that are hard for the tall person, but not the short person; and there will be moves where the reverse holds true. However, because boulder problems have very few moves, the impact on the grading of moves that favor a specific body morphology is normally more drastic, leading to more instances in which there is a subversive influence of grades on climber experience. This is why we have chosen, in this experiment, to remove the grade placards in the bouldering area. A nuanced difference in the world of climbing grades is between on-sight vs red-point grading. On-sighting a climb is when you complete a climb bottom to top, without falls, on the climber’s first attempt without any prior knowledge. Red-pointing a climb is when you complete a climb bottom to top after multiple attempts. There are some climbing areas where the grading is designed for the on-sight climber, taking into account that the route grade will seem higher to the climber who knows nothing about the route except what they can see from the ground. Whereas after a few attempts of trying the moves, playing with different sequences and discovering efficiencies, the climb will feel easier with this “additional knowledge” – thus for the same route a red-point grade may be easier than an on-sight grade. At Salt Pump, we use red-point grading because indoor climbing is the perfect environment to try routes and boulder problems over and over again. Thus we’ve designed our grades to reflect that there may be very thoughtful and unique sequences that, upon discovery, will make the climb feel a little easier. The mental comfort and confidence in knowing what lies above can give the climber a leg up in itself. All of those details speak to red-point grading as being the most befitting for a climbing gym. Now that you’ve read our vision on why we are experimenting with a number-free environment we implore you to leave your computer screen, mobile phone or tablet, and go climbing! We look forward to seeing you at Salt Pump soon! All we ask is that you provide us feedback on this experiment and maintain the experience for others. It’ll be hard to know if someone has looked at the grade of a boulder problem yet, so let’s just refer to the problems by their colors, their holds, or their movement. Thank you for helping us keep the experience unique for all!